Today's shoppers follow brands on Facebook, Pinterest, and Instagram - not websites. Marketing needs to move fast and commercetools is built for speed. Give your commerce team ultimate speed, control and flexibility to drive sales from new channels. Rather than using your Facebook page or Pinterest board for brand discovery, start turning followers into buyers, reviewers, and influencers in one fluid transaction. 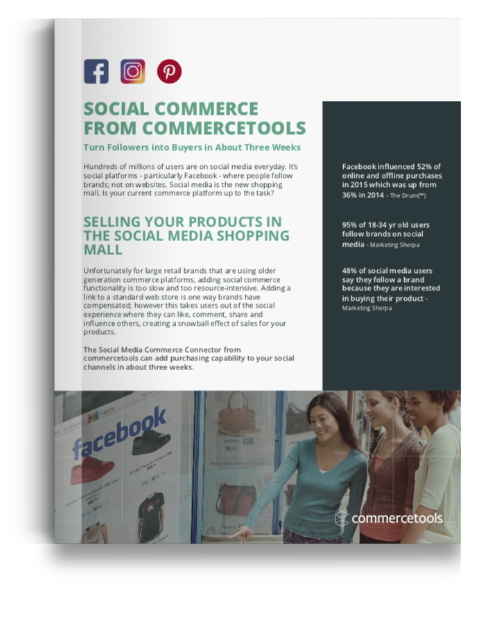 In this one-page Information Sheet, we break down all the benefits of the social media commerce solution. Using our Facebook integration, commercetools customers can sync data in their commercetools product catalog with their Facebook page. Generate sales directly from Facebook without a web store. You can define pricing, promotions and stock levels specifically tailored to how, what, and for what price you want to sell your products in your Facebook channel. Like Facebook, our Pinterest integration enables commercetools customers to dynamically create pins based on their commercetools product data. Once synced, your pins will include relevant information to users of Pinterest such as product title, price, and a link to buy from your website. You can still use the numerous promotions and campaign engines Pinterest offers, but in a dynamic way based on our product feed. Keep your customers up-to-date on the status of their order with our Twilio integration. SMS: Your customers can check their order status by simply texting their order number to commercetools. By Phone: Your customers can call us and enter their order number on their keypad to have a current status update spoken to them via Twilio’s text-to-voice system.